Home » Broadband » Better bundles and more joy from Econet? 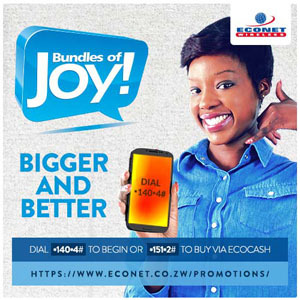 Better bundles and more joy from Econet? Econet has decided to tweak its Buddie Bundles of Joy product by extending the validity periods for its $2, $5 and $10 bundles. The $2 bundle is now valid for 2 days, the $5 bundle will get you 3 days of service and the $10 bundle is now valid for 4 days. The Bundles of Joy promotion has been around for a while now.It was launched in August last year and underwent adjustments on the minutes and the amount of data offered for each bundle at least twice since its introduction. At the beginning of this year the bundles were made available for $5, $10 and $20 only, a position that was reversed in June when they reintroduced the $1 and $2 bundles, albeit with slightly fewer minutes and reduced validity periods. It’s another attempt to extend the value of every subscriber’s dollar, although this latest adjustment still falls short of the 5 days worth for $5 promo that started the joy in August last year. Econet has been making these adjustments in response to the fluctuating voice revenues. This situation has been caused by tighter economic conditions and the way mobile subscribers have lapped up cheaper options for communication like Instant Messaging. This latest effort is pretty much in line with what Econet CEO Douglas Mboweni mentioned at the company’s annual general meeting. The operator’s competitive focus will not be on mind blowing tariff reductions but will be more on product quality and service. This was Econet’s formal declaration that it would not engage in any more tariff wars, a situation that has seen subscribers of the different networks benefit from fabulous “all you can eat” offers to maintain their loyalty.